Arrive at reception or toddle along the glossy corridor that connects the front of the former coaching inn, where you find sitting room, bar and purple-hued Conservatory restaurant, to the Verbena Spa at the rear, and half way along comes a surprising sight. On a sunny afternoon a glance through plate-glass windows revealed a bevy of bikini-clad ladies, their spouses and offspring cavorting in a fair-sized courtyard swimming pool, surrounded by sun loungers, umbrellas, foot spas and bubbling hot tub. This is the Feversham Arms’ unique sales point: an “urban beach” in the middle of a 33-room hotel in the middle of a town in the middle of the moors. And very jolly it is, too, once you have, if you weren’t expecting it, reconciled such artifice in so countrified a part of the world. 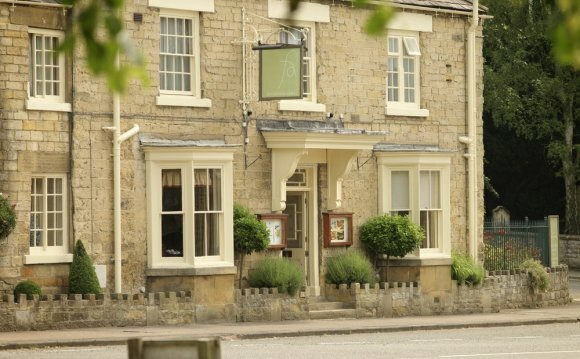 If you are coming to Yorkshire mainly for the wild and the walking, the castles and the romantic ruins, then the Feversham Arms is not for you. It’s not for the locals either (“We never go”, one told us). But if you are coming mainly for pampering, plush shopping and strolling in heavenly Helmsley, then here’s your spot. By now we were crotchety. Mother and daughter had driven an hour and waited 20 minutes for a drink (“you’d think they were mixing the most complex cocktail in the world with all the to-ing and fro-ing behind the bar, but all we’d asked for was two glasses of wine” ). In the purple-hued restaurant, staffed entirely with Polish waiting staff, service was well meaning but haphazard and very slow, but the food, when it came, saved the night. It was expertly cooked and included the most delicious crayfish bisque with ransoms and fillet of beef with marrow and truffle butter. Not a word of dissension from any of us. Breakfast was less impressive. At 9.30am the Conservatory restaurant was packed with guests arriving as late as they could, for breakfast service stops at that time. These sort of strictures are becoming as antediluvian as trouser presses and increasingly irritating: they spoil the flow of a stay. There was almost nothing left on the decimated buffet unless you count bowls of mustard, ketchup and brown sauce. A tick for the bedrooms: soothing and contemporary in a timeless way that has avoided falling pray to the vagaries of fashion. However, they are expensive.